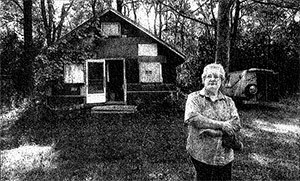 Hazel Leonard of Baraboo believes her family owns this house and at least 11 acres of the surrounding woodland on Madison’s near West Side. The city acquired the land, called Quarry Park, in 1953. Until he died in August each 62, Jim Corcoran lived in a shack without electricity or running water, deep in a 17-acre woods. A few blocks away, on Madison’s near West Side, traffic roared by on University Avenue and shoppers emptied their wallets at Hilldale. Corcoran, a throwback to a time long ago, had grown up in the four-room house with his parents, John and Lottie Corcoran, and seven brothers and sisters. While the affluent West Side developed on farmland around them, the Corcorans burned wood for heat, kerosene for light and used at root cellar in the back to store milk and other perishables. They used a rain barrel in the summer and snow in the winter to get water for washing, while drinking water came from neighbors. The outhouse was a two-seater. The Corcorans were poor but life was good, remembers Jim’s sister Hazel Leonard, 63, of Baraboo. Hazel says her parents built and moved into the shack in 1924 John Corcoran was the caretaker for a quarry on the land bordered by Harvey Street on the north in Stevens Street on the south. Now the family and the city of Madison are disagreeing about who owns the property. It’s a tangled dispute involving old records and long memories. Hazel’s memory goes back to the days when she and her three sisters shared bedroom and her parents another in the shack. The house also had a small front room, a kitchen and an outside ladder to unheated attic where the four boys slept much of the year. In the summer, when it was hot, the boys moved to a granary nearby. The children attended city schools, Hazel says, and had friends in the neighborhood, but never minded returning to their 19th century lifestyle. Jim felt much the same, says a neighbor, Deb Serum, who gave him water and became a friend. Scott Hirschler, another friend, says Jim was a voracious reader and relied on kerosene and flashlights for light. Serum says that Jim was concerned about what would happen to the land when he died. Serum says she and many other neighbors would like the land left just the way it is. Hazel’s not sure what she wants done with the land. But one thin she does know is she doesn’t think it belongs to Madison, as the city has claimed. Hazel says Madison ought to at least pay her family something for the parcel, which the city calls Quarry Park. And, if Madison does end up with the property, Hazel think the name should be changed to Lottie Park in honor of her mother. But Assistant City Attorney John Rothschild says he has found no evidence that the Corcorans ever owned the land, which was part of a large parcel the city annexed from the town of Madison in 1948. The town gave the city a quit claim deed for the land in 1953. Rothsschild says the city let the family live on the property out of kindness after a city assessor stumbled across the house in 1953, not because there was a doubt about the true owners. Rather than evict the Corcorans, the city agreed to lease the home to Lottie Corcoran for $96 a year. After she died in 1984, the city tried to get Jim and his brother Jack to leave. Jack, 72, of Madison, moved for health reasons, but Jim ignored the city. Hazel and Jack say their mother should never have had to sign a lease. They say that Frank Hoyt, a family friend, bought 11 acres of the land from the town of Madison for back taxes in 1948 or 1949 and signed it over to the Corcorans. The town had acquired the land in 1946 from descendants of Ed Paunack, the owner of the quarry, who died in 1931. Jack says Hoyt followed through and that Dane County Title Co. sent the family a letter that said Hoyt has paid $2600 for the property and $50 more to register the title. The letter, though, disappeared after the Corcorans gave their file to a lawyer in the mid-1980’s to help establish their claim. The lawyer, though, says he returned the file to the Corcorans and doesn’t remember the letter. And Lottie Corcoran didn’t seem to know about the letter in 1953 when she talked to the Wisconsin State Journal reporter about the property. Hazel and her sister, Doris Ringstad, 68, of Mazomanie, have scoured title companies, the Dane county register of deeds office and the State Historical Society for Hoyt’s letter or other evidence he bought the parcel. So far, they have struck out and an abstract ordered by the city shows no evidence of the Corcorans’ ownership. Nevertheless, family members are unconvinced and believe they also have the ‘squatter’s rights’ their mother spoke of just because family members lived on the land for 70 years. They’ve talked with Madison lawyer Jim Cole about the possibility of filing a claim for adverse possession under state law because the family lived on the land for nearly 30 years before the city got a deed. Cole has spoken with members of the Paunack family in an effort to discover if the Corcorans use of the land was adverse for the 20 consecutive years required under state law to give them possession. Hazel says the city recently offered $10,000 to her and her five surviving siblings to sign off on any rights to the property. But Jack has refused to sign. “I think it’s work a hell of a lot more that what they’re offering,” Jack says. Rothschild says he isn’t sure what the city will do next. Parks Superintendent Dan Stapay also says he’s not sure what the city will do with the parcel.